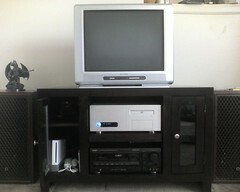 This is my new Entertainment Center (02/14/09). On top of it is a 32″ Toshiba 32AV500U Television. 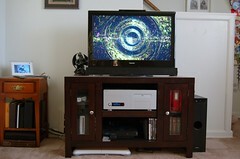 If front of the TV is Sony HT-CT100 sound-bar and to the floor on the right is the subwoofer. Below the speaker bar is a Duel-tuner HTPC homemade DVR running MythTV 0.21 and Mythbuntu 8.04. On the bottom shelf it is a PS2. To the left is the Nintendo Wii with two Wiimote including Legend of Zelda, Wii Fit and Smash Bros Brawl games. The Wii Fit Balance Board is on the floor under the entertainment center.